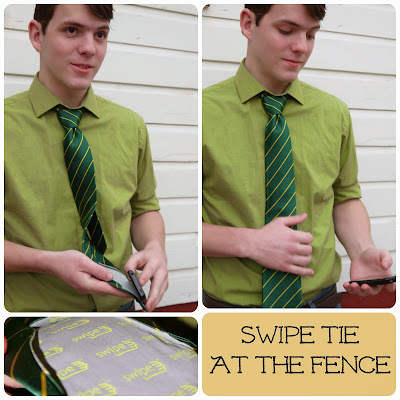 At the Fence: Swipe Ties! I really like Swipe Ties. We have reviewed them in the past, and they graciously offered to allow us to review them again. Swipe ties are designed so you can "swipe" the screen of your iPhone, iPod, or smart phone to clean the screen. This is such a great idea for men. I mean, they don't carry around purses to hold a screen cleaner, so now they can just use their tie. My son recently changed over to an iPhone, and he works in a bank, so this will be for him. He can just wipe the screen clean with his tie. Swipe Apparel is a unique gifts for men store which carries clothes that combine functionality and style into casual wear and business apparel. Our products include the SwipeTie and the SwipeTee, both of which include our integrated, specialized microfiber for easy removal of unwanted elements from iPhones and Android phones as well as iPods, iPads and other tablet devices. Ask anyone that has a smartphone or other touchscreen gadget what they dislike about their device's screen. Most will tell you that it is how dirty and oily the screen gets. Their solution? Rub it awkwardly on their pants or shirt, or carry a cleaning cloth with them. Well, most clothing material (cotton, demin, wool) is not designed to clean glass or plastic screens. Wiping your phone screen on your shirt will minimally reduce the dirty screen or make it worse. And carrying a cleaning cloth...who wants to do that? The Swipe Apparel Team went to work and after months of research and testing, we found the best cleaning fabric and integrated it into stylish and practical everyday clothing. I am thinking they should design a scarf or handkerchief for women. Fashion that is functional. 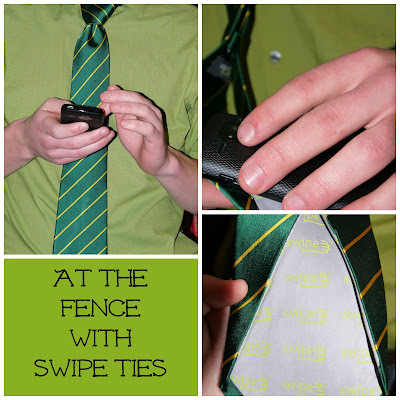 Swipe has tees and ties available made from a microfiber so they are safe for cleaning the screen of your device. Tees are $24.95 and ties are $39.95. If you are unsure of a pattern or design for that special someone you can opt for a gift card. Swipe sent me a second tie for giveaway. I am including a picture here so you can see the tie. As I will be shipping the tie this is only open to US residents. Here is a 10% coupon off any SwipeTie purchase for your gift giving. The coupon code will be "HOLIDAY10". As an added bonus, if you like their Facebook page (facebook.com/swipeapparel) within 20 days of your purchase, you will get a additional 10% off in the form of a refund. I like how safe it is for screens. My hubby is going to use his tie anyway for the same thing, it would be nice to have something designed not to scratch the screen. I like that it is multi functional. I like that they have such nice designs while still cleaning the screens! I like that it is safe for cleaning and also a fashion statement. I like that it isn't just a tie and that it is safe to use on phones too. Perfect for the business man! I need this! And I won't lose it. Great idea. Definitely needs to get these as gifts this year! Very practical gift that would appeal to all the nerds ... and most of the guys who you wouldn't group with the nerds. Brilliant gift - cause they use their ties to clean the screen with anyway.